Date & Time: 2016/7/8 (Fri) 4:30 p.m.
Abstract: The models considering fast mantle upwelling without an addition of volatile-bearing components are failed due to high melting temperatures of mantle silicates. Thus, considering mantle plumes one should add fusible component to the system. In most geodynamic models fusible component is involved indirectly. Nobody consider the real process of melt movement through presumably non-porous mantle matrix or understand the nature of melt, which assist material transport in the very deep mantle. Some mechanisms, such as melt percolation or hydraulic fracturing, are applicable for lithospheric depths and cannot be considered as reliable for deeper mantle with high plasticity and low porosity. The most likely mechanism, which can operate in the deep mantle to assist plume ascent is the stress-driven dissolution-precipitation, however, the possible fusible component of plume melt in the deep mantle is a matter of debates. Here, I discuss possible compositions of melt in the upwelling mantle, which can drive material transport under superplumes and hot spots originated from the transition zone or from the core-mantle boundary of the Earth. An important requirement for plume motion would be stress-induced melting and dissolution-precipitation of the fusible component at the front and rear of the plume, respectively. For this process one would have a volatile-bearing melt with low solubility of silicates (5-10%, but not zero) at the temperature of mantle geotherm. The possible candidates are alkali-bearing silicate, hydrous silicate, carbonatite, and hydrocarbon-bearing melts. Alkaline silicate melt and hydrous silicate melt cannot be considered, since a huge amount of silicate can be dissolved in these melts and the process of plume ascent will be terminated by progressive reactions with the surrounding silicate matrix. Carbonated or carbonatite melt is a likely candidate, especially for transition zone. Phase relations in the alkaline carbonatite systems indicate that major melting of subducted carbonates should occur at the transition zone depths. Recently, we proposed a model for mobile carbonatite melt diapirs, generating from the slab in the transition zone, migrating upwards, modifying and oxidizing presumably reduced mantle sections, precipitating diamonds, creating enriched source regions, and initiating volcanism at the surface. Dehydration of stagnant subducted slabs in the transition zone may accompany carbonatite diapir formation, however significant involvement of hydrous species into melting in the transition zone is difficult due to very high solubility of water in ringwoodite and wadsleyite, the major minerals in the transition zone. Indeed, carbonate or carbonatite melt may not survive through the lower mantle due to presumable reduction to diamond or other carbon-bearing species (carbide) if we assume redox state of the lower mantle close to the iron-wustite (IW) buffer. Thus, hydrocarbon-bearing melt can be the best candidate for the liquid portion of a mantle plume arising from the core-mantle boundary. There is limited amount of information about hydrocarbon phase relations and reactions with silicates in the lower mantle due to an extremely difficult experimental setup. Our recent melting experiments on peridotite and eclogite systems with reduced C-O-H fluid at 3-16 GPa indicated significant solubility of silicates in the coexisting C-O-H fluid. The composition of fluid was not measured in the experiments, whereas theoretical estimates indicate a mixture of H2O with methane and possibly heavier hydrocarbons. Similar fluid/melt containing H2O and hydrocarbons with a relatively low solubility of silicate components at mantle temperatures can exist through the lower mantle and can be considered as the most reliable candidate for the fusible component of mantle plumes from CMB. 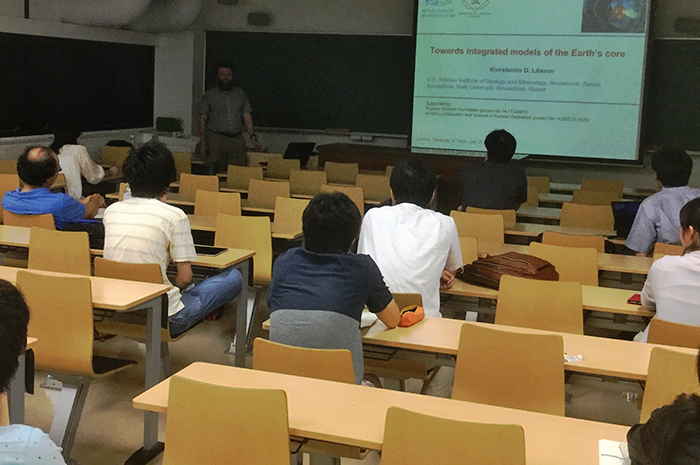 Date & Time: 2016/7/11 (Mon) 3:30 p.m.- 5:00 p.m.
Abstract: I examined evidences from seismology, thermal physics, paleointensity records of geomagnetic field, cosmochemistry and meteorite compositions, metal-silicate partitioning experiments, phase diagrams and equations of state of iron and iron compounds to present state of art on the composition and evolution of the Earth’s core. New constraints from paleointensity measurements indicate possible inner core age of 1.4, 0.8, and 0.5 Ga. Magnetic field intensity and reversals are consistent with plume and supercontinent cycles. Metal-silicate partitioning experiments are inconsistent with the model of basal magma ocean and very hot initial core, which is required by new data for thermal conductivity of iron and alloys at high pressures. Core remains most enigmatic layer in the Earth’s deep interior. The problem of light element is not solved. Silicon and oxygen may be major light elements according to metal-silicate partitioning experiments, however other elements are poorly studied. Fe-carbides are reliable candidates for inner core according to new phase relations and EOS studies. Further complications arrived from our hydrogenation and nitrogenation experiments. From experiments at 6-20 GPa and temperatures up to 1600 K we obtained following sequence of relative reactivity/stability of Fe-compounds in the studied PT-range: Fe-S > Fe-N > Fe-C > Fe-H > Fe.